Now that so many Americans are ordering products on the Internet instead of purchasing them at neighborhood stores, the need for box truck deliveries is skyrocketing. Of course, as these box truck drivers search for delivery addresses in crowded urban areas, serious and fatal accidents with pedestrians, cars and cyclists will likely keep increasing. Before briefly reviewing statistics on New York truck accidents, here’s a closer look at specific types of delivery and box trucks – as well as the mistakes their drivers often make that cause so many serious accidents. Although they’re sometimes called “box vans” and “cube trucks,” most of us recognize these vehicles as the U-Haul, UPS, department store, FedEx and DHL delivery trucks that pull up next to us at busy intersections or bring our ordered goods to our homes and businesses. Box trucks usually weigh between 12,000 and 30,000 pounds and feature a large cargo area in the back that’s normally shaped like a square or rectangle. Many box trucks way as much as six tons – which explains why they often cause so much fatal damage upon hitting a typical passenger car weighing between one-and-a-half to two tons. Of course, box trucks often cause even more deadly damage when they slam into pedestrians, motorcyclists and bicyclists. What special vehicle safety challenges do box truck and delivery or cargo van drivers face? Poor truck maintenance. These vehicles face heavy use and may not always be pulled out of circulation long enough to fully handle various repair needs. Thinning tires, worn-out brake pads, poorly adjusted or broken side mirrors and broken windshields all play a role in causing extra accidents. What are the most common types of poor driving habits of box truck drivers? Like far too many other negligent drivers, delivery truck accidents often occur due to one or more of the following careless behaviors. Dangerous parking. Given their large blind spots, it can be very hard for drivers to carefully navigate crowded parking areas without hitting pedestrians or others. The Bureau of Labor Statistics reports that workplace injuries involving harmful transportation incidents were among the most fatal events of 2016, causing between 25% to 40% of these accidents. In fact, workplace deaths tied to trucking accidents often exceed 700 a year. This is a demanding job that doesn’t pay very high wages – and often requires personally packing and delivering all the goods to purchasers’ doors. A January 2018 Newsweek article stated that truck drivers making deliveries suffered more workplace fatalities in 2016 than any other profession. During the last five years, there’s been an 11.2 percent increase in truck driver deaths. Some industry experts believe part of that increase is directly caused by the major increase in online shopping – and the resulting delivery needs. As Amazon and other major retail online shopping Web sites increase their sales, Americans are likely to see an increase in local truck accidents. 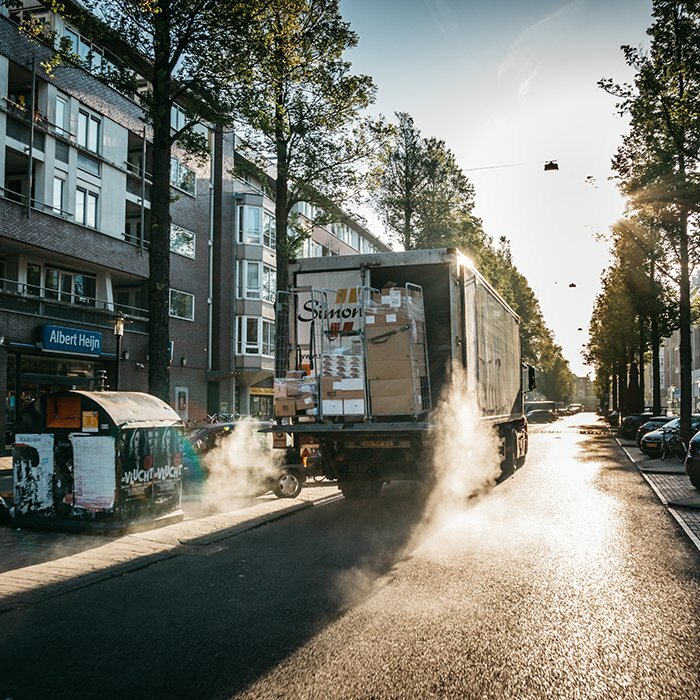 Since many box truck drivers delivering retail and other goods aren’t always employees of the companies that have hired them, complicated liability issues can arise when negotiating a settlement for a client’s injuries – or taking the case to trial. In one year, over 10,000 truck accidents happen in New York State with nearly 5,000 injuries and 100 deaths. Delivery trucks or box trucks are frequently seen driving around the streets of New York City or stopping to make deliveries. Due to their large size, operators of delivery trucks may not have a clear view of pedestrian and vehicular traffic. Truck drivers may not park safely when loading or unloading. They may double park too far from the curb creating a hazard in the roadway which requires other motorists to drive over a double yellow dividing line just to steer around the parked truck. The truck accident lawyers at F&A are experienced in handling all aspects of trucking accident litigation. Our attorneys conduct immediate investigations into the cause of a truck accident and utilize top experts in proving liability. Our firm researches the truck operator and truck owner by consulting their Federal Motor Carrier Safety Act (FMCSA) information as well as other sources. If you or a loved one was injured due to a truck accident, contact us at (866) TRUCK ATTORNEY or call our local # (212) 222 – 1111. We handle all types of truck accidents in the five boroughs of New York City including the Bronx, Brooklyn, Queens, Manhattan, Staten Island, and surrounding areas.